I created this board for Kelley of My Island Wedding, who is considering an all-inclusive, destination celebration with her family in Jamaica for her 40th. Since I'm not headed anywhere nearly as exotic this summer, how could I resist the chance to dream it up for her? 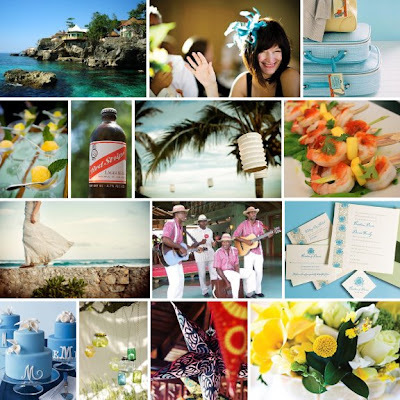 A crystal blue ocean, tropical fruit & flowers, calypso music and a Red Stripe in hand... I can feel my troubles melting away. Kelley is also going to post this over at her blog, and enter it as part of her upcoming wedding inspiration board contest. I may enter another board as well, so head over there to check out the entries and vote for me, beginning Saturday, June 27th. Resources: flowers & feathers via betsy white; suitcases via martha stewart; beach via trip advisor; shrimp via flickr; stars via the knot; invitation by dauphine press; cakes by cheryl kleinman. Thanks sooo much for follow me! Ahhh Jamaica~ I got married there on Valentines day, loved everything about it!